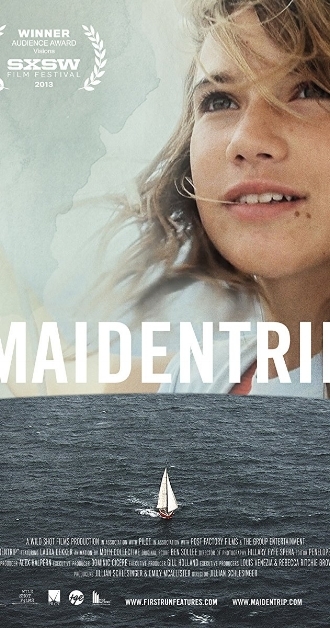 Maiden Trip documents Laura Dekker's journey around the world. She was the youngest person at the age of 15 to make the trip. She garnered headlines before the venture began because an arm of the Dutch government tried to prevent her setting sail. In fact, they tried to take her from her father and place her in an institution. The court sided with the father and off on the seas she went. I didn't realize it until I started watching the film, but I had seen this one a few years ago. Still, since I didn't recall that fact, it was like watching it for the first time all over again. There was probably a reason I didn't remember - overall, it isn't a great documentary. Its interesting in the sense you get a glimpse (not enough of one though) of what life, alone, on the high seas is like. The most compelling aspect is watching her mature and grow into a really independent person over the two years the trip took. She seemed to be fascinated at an early age by the concept of doing what you love and not what society expects of you. I wonder if she is still that way. I hope so, as there is an admirable quality in that approach. More of us should follow that example. She brings up that theme more than once and it is an interesting take when expressed through a young person's eyes. My two favorite scenes from the movie are when she does this Christmas dance on deck to heavy metal music. The scene made me laugh. Also, I liked when she spies dolphins along side and relishes their company. That was a very poignant moment. In the movie though, she doesn't open up enough to make a deep connection with her character. There isn't enough about actual sailing to connect with that either. The documentary almost seems an afterthought. Laura Dekker is still out there. I looked her up after the film and she is promoting a book, doing speaking engagements, based on this trip. Apparently she stills sails and is in the industry now. As for this film, I give it 3 of 5 on the rating scale. It could've been so much more. Really, it was a blown opportunity on many levels.